This fall, Colorado voters will make important decisions about transportation funding, but they need the facts to reach the right choice. The hard reality is that just building more highway lanes won’t solve either the urban traffic mess or the economic struggles in rural areas. Instead, Colorado needs a healthy mix of ways to get around – some road work, certainly, but also more buses, bike lanes, carpooling, and similar efforts, as well as a combination of state and local projects. Recent research, in fact, underscores why even mountain towns and rural areas need better transit service. A broad coalition of business organizations, civic groups, and local government leaders (including SWEEP) have backed Initiative 110, which would raise $750 million per year for transportation, including state highways, public transit, local roads, and bicycle and pedestrian improvements. Initiative 110, in other words, provides a realistic way to solve both urban and rural transportation problems. Opponents of Initiative 110 assert that transportation money should just go to highway expansion, and that investments in public transit have little benefit outside of metro Denver. But that claim isn’t based on the facts. Several recent studies examined the economic benefits that public transit systems provide in diverse communities outside of the metro area – and all found significant net economic benefits for those areas. 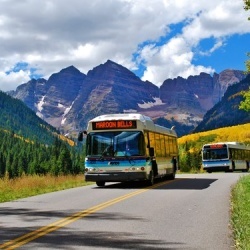 For example, SWEEP just completed an analysis of the economic benefits provided by the Roaring Fork Transportation Authority (RFTA), which provides bus service in Pitkin and Garfield Counties, including Rifle, Glenwood Springs, Carbondale, Aspen, and Snowmass Village. We found that the direct economic benefits are up to $88 million annually – a sum four times greater than the current sales tax supporting RFTA, which generates about $20 million dollars a year. While some of the benefits may be obvious – savings to commuters in lower gas costs, and community-wide savings due to lower congestion – one of the biggest economic benefits may be surprising: transit is essential for many employees to get to their jobs. In these two counties, many employees can’t afford to live where they work and they don’t have cars – and even if they own a car, they can’t afford to park near where they work. If transit didn’t exist, many employees couldn’t get to their jobs and scores of businesses wouldn’t be able to hire enough workers. We quantified the value of this access at more than $50 million dollars per year. Moreover, if they couldn’t use public transit, some of these hard-working Coloradans might have to go on public assistance. The study pegs the 2018 potential for lost wages at $53 million, and the potential increase in public assistance payments at $1.75 million. In 2014, the Economic Development Research Group conducted a similar study of the transit systems in Grand Junction and in Colorado Springs. Grand Junction is a city of about 60,000 residents in the otherwise largely rural Western Slope. Colorado Springs, with a metro-wide population just over 700,000, is still much smaller and less dense than the Denver area. In both communities, the 2014 study found positive economic benefits that significantly exceed the costs of running the transit system. As is true in the mountain towns, significant numbers of workers in both Grand Junction and Colorado Springs need transit to get to work. For example, in Colorado Springs, over 15 percent of people working in the health care and social services fields relied on transit to get to their jobs. Without the access provided by the transit system, the economy would suffer, and life would be substantially harder for many lower-income commuters. Rural parts of Colorado, such as the Eastern Plains, also benefit significantly from public transit. While total ridership on transit in urban areas is higher than in rural areas, transit provides a lifeline for many people in rural parts of Colorado – without it, many rural residents (especially the elderly) couldn’t get to medical appointments, employment, grocery stores, or other services. Transit will be an increasingly important tool for rural Colorado’s rapidly aging residents. The population of rural Coloradans over the age 75 is projected to grow to over 160,000 people over the next 20 years. The Denver Post recently reported on the difficult struggles that elderly and disabled rural residents face when transit service isn’t available. While SWEEP advocates for expanded public transportation because of the benefits it brings in making our overall transportation system function, including lower energy use and less air pollution, these studies show why transit is critical to the economies and people of communities statewide.